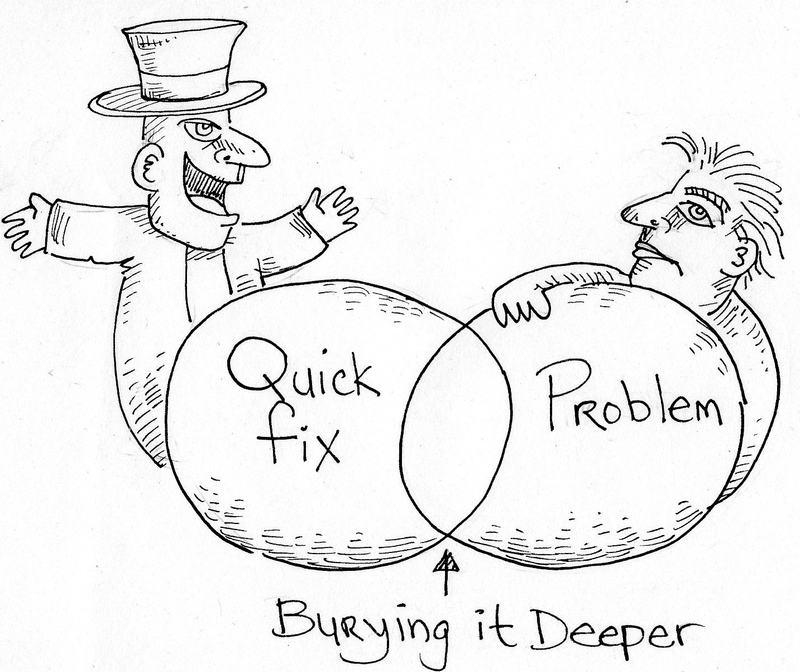 At what point do we finally wake-up to the fact that there is no such thing as a lasting, transformative “quick-fix?” We have suffered through over 50 years of “church-in-box” programs that have produced poor results at best. Disciple Bible Study came closest to delivering transformation, but ultimately “popular” did not translate into “effective.” Literally thousands of people have had wonderful, meaningful, enjoyable Disciple experiences. However, a variety of independent follow-up evaluations indicate that there is a very low retention rate, that few people adopt sustained spiritual formation practices, and few report any transformed behavior in their daily lives. I will hear about the handful whose lives were completely changed, and I do not devalue any such experience — but unless Disciple has been an integrated component of a comprehensive developmental process of spiritual formation, it remains a pleasant experience for the vast majority. No, our Bible studies, evangelism programs, stewardship campaigns, membership drives, and 7 Habits, 10 Keys, 12 Steps, and 40 Days remedies have done little to make us a city on the hill or a light in the darkness. Where this occurs, there is hard work, commitment, vision and prayerful discernment shared by the many rather than the few. Look, if you set out walking in the wrong direction, and you keep walking for thirty or forty years, depending on how far off course you are, it is going to take more than a few weeks or months to get where you need to be. Churches that have allowed worship to become passive edutainment, stopped doing any real invitational evangelism, ignored a focus on whole-life or financial stewardship, don’t promote adult education and spiritual formation, and don’t expect and require all members to be involved in hands-on outreach and service are not just making adjustments — they are faced with changing the entire culture. You won’t find the answer how to do this in a 200-page “we did it, you can do it too!” church leadership book. And you won’t discover your answer in any lame “best practices” workshop, either. Turn-around churches almost all agree: they knew what they needed to do before they did it. It isn’t ignorance that fosters decline; it is apathy. Churches that truly want to grow do so. Churches that want to serve do so. Churches that want out of financial hardship do it. For every declining church you can name, there is a growing one just like it in most ways. The key difference? Declining churches expect their answer to come from the outside; growing churches seek take responsibility for their own solutions. An example: two churches just eight miles apart. Both, experienced membership decline from the 1990s through 2007 — older people died or moved away, no new young families, giving decreased and both congregations supplemented their finances through fund-raising dinners. In 2007, the respective attendance of the two congregations was 67 and 63. Congregation A looked to the pastor and the Annual Conference for assistance and direction, wanting help “attracting young families and growing the church.” Congregation B recognized that they had very little to attract new people and that they weren’t doing anything proactive to reach out. A core group of 21 members made a commitment to invite at least one friend, neighbor, family member, or colleague to a small group, a work project, a fellowship event, or worship each week. 2011 – Congregation A, 41 in worship and on the verge of closure; Congregation B, 121 in worship and beginning a capital campaign to renovate and expand. In over 200 years, one key of evangelism has remained constant: personal invitation is the key to growth. Rarely do people come to a church and stay because of the preacher. Certainly it happens, and it happens enough that people pin their hopes on it happening in their church, but it is the exception, not the rule. Cold calling door-to-door has some limited success when launching a new church, but it has never been overly effective (even for the Mormons or Jehovah’s witnesses, whose growth is dependent on (wait for it)… families and friends). Advertising in phone books and on billboards (and now websites) may catch a few first-timers, but if they don’t connect right away and form relationships, the retention is very low. No, across the globe, churches grow because people who love their congregation want to share it with others. There is no short cut or magic pill to make a congregation grow. Same goes with finances. The churches in the best financial shape do four things: they identify things worth spending money on, they ask people to give, and they spend what they receive on those good things, then they ask for more. Poverty is never an issue. Fixed income doesn’t enter into it. Bad economy is never an excuse. Congregations give when there is something worth giving TO. And paying the churches bills and keeping the church out of debt isn’t good enough. People with expensive hobbies pay their bills AND have money for the things they care about. The only reason I have ever found for a church being in financial trouble is that the members and participants don’t care enough to support it. Where the treasure is, there the heart is also. When people really care about something, they invest themselves completely in it. Those that don’t have the funds, find the funds or raise the funds. Those who can’t afford ask those who can. The money is ALWAYS out there — it all comes down to how badly do we want it? How important is the work of God through our church to get us motivated to fund it? Healthy churches never waste time asking “can we or can’t we;” their only conversation is “how will we?” We can prayerfully hope that a huge bequest will drop in our lap, but that’s no way to build a plan. There is no stewardship campaign that will transform a local churches financial picture. That happens through vision, sweat, strong relationships and a Spirit-directed faith. Our other penchant is to wait until it is too late to turn anything around. We decline to a point where we literally have virtually nothing left, then we start looking for solutions. Denial is one of the greatest threats to our church health. Just as we can only deny our need to watch what we eat, exercise regularly, rest well, watch our blood pressure, etc. so long before we hit a point of crisis, we can only allow our congregational reality to decay so long before disaster strikes. The hard reality is that our own health, vitality, and future rest squarely with us — no one else will guarantee them for us… and what worked for one church is highly unlikely to work for us. We need a customized plan of learning, worship, giving and serving that fits us — that honors the unique gifts, skills, knowledge, talents, passions and experiences of our particular fellowship — and will generate an attractive energy that allows us to get excited enough about who we are and what we do that we want to tell and invite the world. And such deep knowledge and integrated relationships take time. We better get started soon. Yes, I do agree. To show my appreciation, I’m sending you my personal collection of resources that includes processes, steps, guides, manuals, videos, DVD’s, and an assortment of handouts, procedures, formulas, methods, schedules, flow charts, accessories, pictographs, laminated folders, and 3 ring binders. It so happens I’ve been cleaning house when I read your blog. You gave me a little motivation to step up the process! Dan makes me think, and sometimes cry. Dave, this made me laugh. My church has been holding it’s own funeral for @ 7 yrs. Which is about 15 yrs. after the denominational funeral began. Much as my friends and family love me, they just will not come sit through that. Many of them think I must be crazy to sit through it myself. Worship, service and outreach. But NO MORE STUDIES. Dan, after the meeting we had here this week with our DS, this really hit the spot. Hope you don’t mind but it’s my bulletin insert for the week! Thanks,Dan, for reminding us of the big picture. I know I too often get snagged by details that are really of little consequence, when there is a great harvest waiting for us. And Jesus promised the workers would be few.